Nadja, who we last saw gracing Berlin at the bleakrave party PURGE, have just released a pre-order link (which promptly sold out, although you can stream the songs through Bandcamp) via their own label for their new LP Dagdrøm. The album features the drumming of Jesus Lizard‘s Mac McNeilly in place of their usual drum machine, and the duo are calling Dagdrøm their rock album, though this might sell the four-song release short. It still comes bearing the gorgeous and heavy darkness of their more droning, ambient, “metalgaze” albums, with deep and creeping vocals breathed over brooding, radio-length defying compositions. Nadja‘s Aidan Baker (guitars, woodwinds, vocals, drum machine) and Leah Buckareff (bass, vocals, accordion) now reside in Berlin. Kristel Jax caught up with them in Lichtenberg (the ex-Soviet borough they call home) to talk about Dagdrøm, their label Broken Spine Productions, life as ex-pats in Europe, and making music as a couple. How did the collaboration with Jesus Lizard’s Mac McNeilly come about? Aidan Baker: I did a tour a couple of years ago with David Simms, the bass player in Jesus Lizard, with my solo project. I got Mac’s contact from him and wrote him an email and said “Hey, do you want to make some music together?” He said sure. Very straightforward and simple. You do a lot of improvising as musicians – is Dagdrøm largely improvised? AB: No. We’ve been calling it our rock album because it’s considerably more straightforward than a lot of our other albums; less improvised, and more structured. Did you all work together on the song writing? AB: I did the core and then Leah filled it out. We basically gave a guitar and bass demo track to Mac; he layered drums on top of that and sent it back, and then we fleshed it out. Is the new album a good intro to Nadja for people who haven’t heard your music yet? Leah Buckareff: It’s pretty different. AB: It could go either way – it could be a bad introduction because it’s not necessarily representative of our back catalog, but it’s also a bit more accessible, so maybe it would appeal to a wider audience than a lot of our other stuff has. What made you take the rock approach – was it a natural result of having the live drums, or something else? AB: Certainly it was in part due to the live drums – and we kind of structured the songs specifically with Mac’s fairly distinctive style in mind – but really it was just because we wanted to do something different. In a lot of ways, even if they don’t necessarily sound like our older material, these songs look back as much as they do forward. You released the album on your own label, Broken Spine Productions. Can you tell us a bit about the imprint? AB: We started about two years ago now, really just as a way to take control of our own production more than we’d been experiencing. It had a lot to do with control, and supply and demand; we tour a lot so we’re always trying to get more copies of releases from labels, and sometimes that was easy and sometimes that was harder. Having our own stock in our own place to grab off the shelf and take on the road makes it a lot easier. LB: Also for the first time in two years ago, we were actually sustaining ourselves with music, so we thought it seemed natural to work this way. We’re just doing it, and everything happens in our own studio. It’s nice. What would you say about the pros and cons of releasing your own music? LB: The PR machine that some labels have behind them – we obviously don’t have that. AB: There’s definitely that whole network and nepotism factor that we don’t necessarily have because we’re doing it ourselves. It’s also pretty expensive. There are lots of things we’d like to be releasing and we’d prefer to have a more steady release schedule, but at the moment the return is not really enough to keep doing it on a strict schedule so we’re just going to keep doing it on a whatever-we-can basis. I guess we covered the pros already. So you’re only releasing your own projects right now? LB: That and collaborations with other bands. 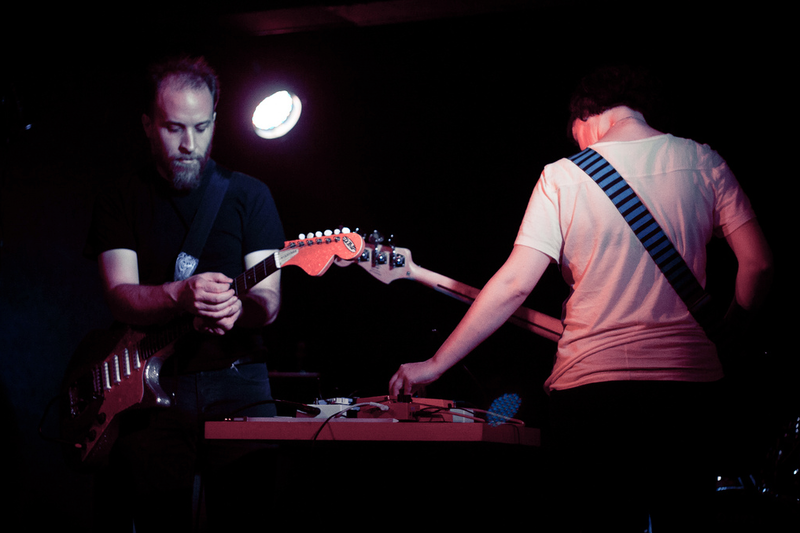 How does playing and recording experimental music differ between Toronto and Berlin? LB: We haven’t really changed the way we record necessarily; we still do it on our own. I think Berlin’s one big perk is that there are so many artists that we knew all around the world who have somehow ended up here, that we can collaborate or cross paths with. There seems to be a lot more collaboration happening here. AB: The community seems a little wider. I know there’s a big music community in Toronto too, but it’s sort of local to Toronto, while here it’s not just local to Berlin; it’s local to Germany and Europe too, so there’s an extra layer of local-ness. Another difference is we don’t need a day job here. In Toronto, we always needed something else to pay the rent, but here we can make a living from music. Do you think that’s because of where the band has gone naturally, or is it because you’re in Berlin that you’re able to sustain yourselves with music? AB: Berlin is much cheaper than Toronto; the cost of living is pretty low. LB: But the standard of living for people who don’t have money seems a lot higher. AB: We don’t qualify for social benefits because we’re not residents of the EU, but it’s a lot easier to live as an artist here doing your own art, or on some kind of goverment subsidy. There’s a program in place where, if you’re an artist and you make a certain amount of money every year doing your art, then you qualify for this government subsidy that will cover half your health insurance costs. We haven’t gotten on that yet but we hope to. AB: The population of Germany itself is three times that of Canada, so it’s that much easier to tour and play shows. Michael Gira said in a recent interview that he absolutely advises to not tour with your spouse. What do you two have to say to that? AB: I read that interview actually. I think we’re very different people than Michael Gira and Jarboe though, so perhaps we don’t face the same issues that they do. LB: Of course you fight, but you both know you’re on tour, and you have to be in a certain place at a certain time. You do what you need to do. It’s okay. AB: It’s certainly nicer traveling with Leah than other people. I mean, I spend the rest of my time with her too, so why wouldn’t I travel with her. What’s next for Nadja; more rock, or some other direction? Other directions, definitely. We’re just finishing up another album for Brazil’s Essence Music, which is more sort of industrial/noise/krautrock or something, and we’re also working on a grindcore EP as well as a collaboration with an Italian hip-hop duo. The pre-order link for Dagdrøm sold out quickly, but the regular LP and CD will be available as of late October from the Broken Spine webstore and digitally via Bandcamp. US distribution is through Revolver.